From Thailand to the Philippines, a flurry of threats to democracy and human rights have swept across Southeast Asia in recent years. Authoritarianism and one-party politics are on the rise. Now, observers say, Cambodia may become the region’s newest one-party state. Tensions have been brewing for a while, culminating last week in the Supreme Court’s decision to dissolve the Cambodia National Rescue Party (CNRP), the country’s main opposition group. Banned from political activity for five years and stripped of parliamentary seats, many CNRP officials have fled the country. This paves the way for the ruling Cambodian People’s Party (CPP) to run virtually unopposed in July’s general election. The CPP claims the decision was made in accordance with the rule of law, and has pledged to continue to adhere to democracy at a local and national level. On Thursday, the government reallocated the CNRP’s seats to smaller parties that failed to secure any in the last election. However, many doubt the legitimacy of such statements and actions. “It means the end of democracy in Cambodia, full stop,” Sophal Ear, associate professor of Diplomacy and World Affairs at Occidental College, Los Angeles, told The World Weekly. To many, the latest move came as no surprise. Prime Minister Hun Sen’s government has cracked down on the opposition and its supporters since the 2013 elections, in which the CNRP won a record number of seats. The crackdown intensified in September when CNRP leader Kem Sokha was arrested, accused of conspiring with the US to overthrow the Cambodian government. 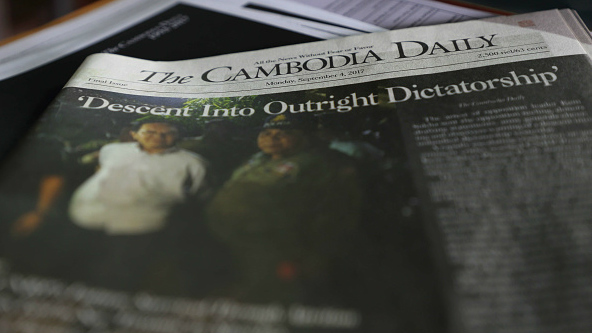 A rollback of civil society in recent months has seen the shuttering of many media outlets, including the closure of several radio stations and the country’s leading English-language newspaper, The Cambodia Daily. Frequent and strident curbs on activities of foreign NGOs have also been evident. Human rights groups and members of the CNRP have urged the international community, particularly leading donors and trade partners, to take action. But the question remains: How best to proceed without damaging the fragile climate of relative peace and stability in Cambodia? Mr. Hun Sen is one of the world’s longest-serving leaders, having ruled Cambodia since 1985. He came to power after the toppling of the murderous Khmer Rouge regime and its communist leader, Pol Pot. Under Pol Pot, Cambodia suffered one of the worst genocides of the 20th century, which claimed the lives of up to two million Cambodians. Over the years, a large peacekeeping operation and billions of dollars in foreign aid have transformed Cambodia into a country hailed by some as a stable post-conflict nation. However, critics say that democracy in the country, a crucial requirement for receiving foreign aid, has been little more than a smoke screen for an oppressive regime. Despite reports of violations, campaigners say the international community has consistently turned a blind eye to human rights abuses and non-democratic behaviour. Foreign donors have given around $20 billion in aid to Cambodia over the past 25 years. Preferential trade access to European and US markets has kickstarted economic development, with Cambodia’s textile industry flourishing in the past few decades. Taken together, the EU and US account for 60% of all Cambodian exports. However, all this may be about to change. The first concrete action taken by an EU country came on Tuesday, when Sweden announced a cut in new aid, except that earmarked for education and research. Meanwhile, there is talk of blocking Cambodia from the “Everything but Arms” trade scheme, which grants tariff-free access to European markets for certain developing economies. Alternative measures are available. The White House announced on November 17 that it planned to cut a $1.8 million grant to assist in the 2018 elections. Further steps could include travel and visa bans against CPP officials, as well as foreign asset and property seizures. Prime Minister Hun Sen has brushed off Western criticism and appears undeterred by economic and diplomatic threats. On Monday, he challenged the US to cut off all aid, as financial support from China renders Western sanctions mostly ineffective. 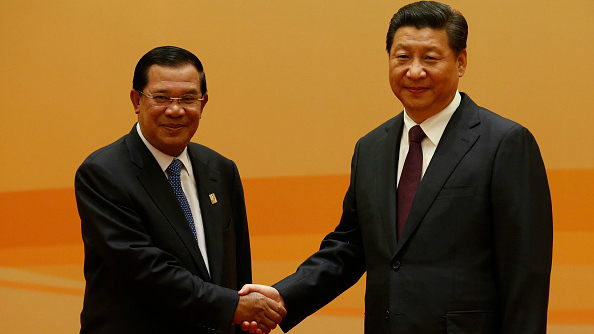 The Chinese foreign ministry has said the country backs Mr. Hun Sen’s efforts to “protect political stability”. China is now Cambodia’s biggest source of foreign investment, providing money which comes without the conditions demanded by other countries. Chinese investment, observers say, is facilitating the prime minister’s autocratic turn. Across Asia, Chinese capital is financing various governments who have fallen under international criticism for their undemocratic practices, including human rights violations. Ties between the Philippines and China are tightening as the death toll from President Rodrigo Duterte’s war on drugs continues to rise. The military in Myanmar, accused of ethnic cleansing against Rohingya Muslims, maintains close links with Beijing. Military cooperation between China and Thailand has also grown in recent years. Thailand is currently under military rule following a 2014 coup. The future looks uncertain. Economic sanctions risk harming ordinary Cambodians, and do not ensure the implementation of democracy. What is more, a pivot towards Beijing could isolate Cambodia from pressure to end the ongoing rollback of democratic practice and civil society. Cambodian democracy is on its last legs. However, as the international community prepares to act and CNRP officials continue to speak up in favour of democratic rights, the fatal blow may not have been dealt just yet.